SAN MARCOS — Prominent figures in society, businessmen and ordinary citizens who have helped shape San Marcos’ history over the years won’t be forgotten in a dusty archive since Eagle Scout Olivier Jamois infused them with new life online. 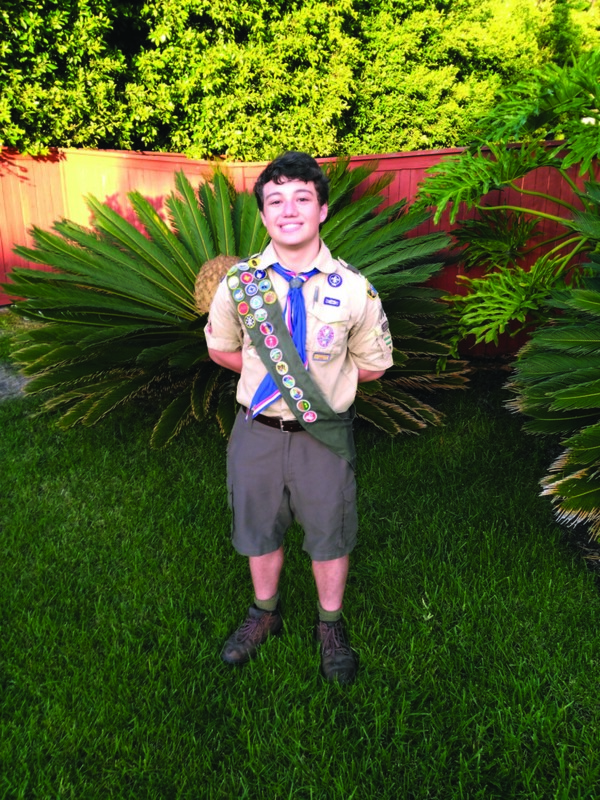 The 18-year-old San Marcos resident and member of Boy Scouts of America Troop 709 in Vista recently earned his way to Eagle Scout by taking charge of creating a database for the San Marcos Historical Society’s website. Now researchers, families, historians, educators, genealogists and other North County residents can quickly search an alphabetical database to access historical obituaries, biographies and other articles and get copies for a fee. Dedicated to Boy Scouts for the past seven years, but a combined 12 years including his stint in Cub Scouts, Jamois said he was drawn to the Boy Scouts’ opportunities to develop communication skills, leadership skills and outdoor activities. His favorite experience with the Scouts happened three years ago when he took a train to New Mexico and spent two weeks backpacking the backcountry at the Philmont Scout Ranch. But it was Jamois’ interest in computers that led him to choose the Genealogy Records project for his Eagle Scout designation. Jamois said he had completed three computer science classes at San Marcos High, including two courses offered through a dual enrollment program in partnership with Palomar College, before he graduated in June 2017. Currently he intends to major in computer science at the University of California San Diego, which he began attending Sept. 28. His Eagle Scout project began to crystallize in the summer of 2016 when his junior year U.S. History teacher Jan Wright, who happens to be secretary of the San Marcos Historical Society, put Jamois in touch with a fellow historical society board member, President Tanis Brown. Together, Brown and Jamois narrowed Jamois’ Eagle Scout options down to three possible projects: renovating a deteriorating gazebo previously created by another Eagle Scout; creating a rainwater collection apparatus for the historical society campus; or organizing the historical society’s collection of records in an online space. Although Jamois was presented with the three options, Brown said the selection was entirely up to Jamois. Brown said the San Marcos Historical Society board of directors identifies “wish list” projects that can be accomplished through extra funding or volunteers. About the time Jamois met Brown, the organization had just started offering genealogy classes and the instructor, Julie Miller, suggested that having an online reference would be a benefit to those who do research. The time intensive project was added to the wish list. Once Jamois made his selection, Miller, a professional genealogist who has done extensive research of family trees, linked him to online sources that had basic information and easy to follow directions to more in-depth research and how to obtain that information. In March, Jamois said he set about organizing news clippings, obituaries and photos that date back to the early 1900s with the help of 10 to 15 volunteers from his Scout troop. Jamois would give the volunteers one of more than 20 binders of historical data and teach them how to input the data in the computer. The binders were arranged alphabetically by last name, and so, much of the information was transferred on spreadsheets that would correspond with the first letter of the subject’s last name. The volunteers brought their laptops to the San Marcos Historical Society Heritage Park museum, located in Walnut Grove Park at Sycamore Drive, where Jamois estimates he spent up to 40 hours himself on the project and the volunteers contributed 115 hours altogether. While the project progressed through May, Jamois kept track of his enterprise in a workbook that would be evaluated by the Eagle Scout Board of Review as part of their process for bestowing the highest rank a Scout may achieve. The workbook is arranged with an initial plan of how he would foresee the project panning out; then a final plan of how the project was actually completed; a project report of what went well and what was challenging about the project; and a log of volunteer time. The workbook is filled out with pictures of the process, permission slips and an introductory statement of ambitions that covers Jamois’ life goals, philosophies and ambitions. “Before, people didn’t even know if a record existed,” said Jamois, explaining that historical researchers can now easily scan for information on the San Marcos Historical Society website from their home and work computers. If the search leads to desired information, whether it’s photos, obituary records, or biographical information, consumers can contact the San Marcos Historical Society via email and pay a fee based on their request. They can pay by check or online through PayPal, said Brown. The project workbook ends with a letter from the San Marcos Historical Society expressing their appreciation for Jamois’ work that concluded in May. Jamois officially earned his Eagle Scout rank on Aug. 16. And the gazebo at Walnut Grove Park that Jamois passed over may have been neglected but it was not forgotten. The historical society plans to purchase a new gazebo that should be installed by the end of October using donations from several generous members, a memorial donation and a recent fundraiser sponsored by Silvergate, a senior residential facility in San Marcos.